Color is life, for a world without color seems dead. As a flame produces light, light produces color. As intonation lends color to the spoken word, color lends spiritually realized sound to form. Harmony implies balance, symmetry of forces. From 1919 – 1922, Johannes Itten developed and taught courses on color theory to students at the School of Applied Arts in Weimer, Germany, or better known as the Bauhaus, the infamous German art school of the early twentieth-century. Initially trained as an educator with an interest in psychoanalytic theory, Itten utilized these ideas into developing his theories on color composition and the relationships of color which became the foundation of his book, The Art of Color (also found in The Elements of Color). In the book, Itten proposed that not only was color experienced and understood visually with such considerations as the 12 Hue Color Circle and the Seven Color Contrasts, but also psychologically and emotionally. While Itten’s ideas on the role and function of color were concentrated and developed within the structure of painting, these same theories can be applied to developing a visual vocabulary and use within the context of color photography. 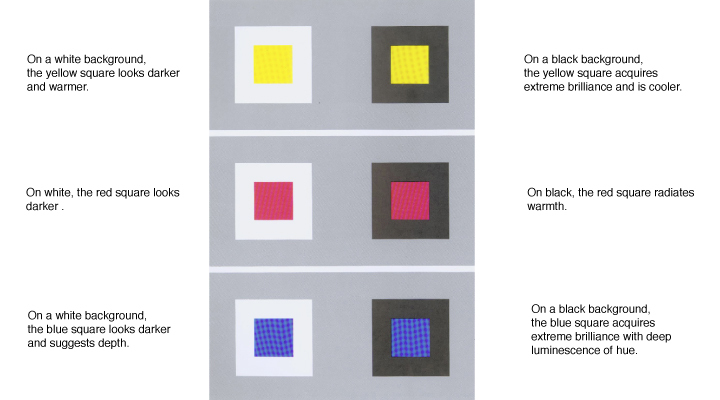 Below are some useful considerations from Itten’s The Art of Color that suggest the possiblities of developing a color sensibility and color harmony in photography – a visual relationship and structure between colors that are capable of serving as a basis for composition and revealing content. Colored light reflected from colored objects modifies the colors of other objects. Color Agent is the physically or definable colorant. Color Effect is the psychophysiolocgical color reality. Color is not only experienced and understood visually, but also psychologically and emotionally. Yellow is the color of sunshine. It’s associated with joy, happiness, intellect, and energy. Yellow produces a warming effect, arouses cheerfulness, stimulates mental activity, and generates muscle energy. Shades of yellow (when gray is added) are visually unappealing because they lose cheerfulness and become dingy. Dull (dingy) yellow represents caution, decay, sickness, and jealous. Passive from the point of view of material space. Always cool and shadowy. Atmospheric. When dimmed, blue suggests fear, grief, and perdition. Intermediate between yellow and blue. Green is the color of nature. It symbolizes growth, harmony, freshness, and fertility. Green has strong emotional correspondence with safety. If the green inclines towards yellow, an energetic sense of nature is felt. Activated by orange, it assumes vulgar cast. If it inclines towards blue, cold and vigorous aggressiveness. Dark green is associated with ambition, greed, jealousy and is also commonly associated with money. Mixture of yellow and red. Maximum radiant activity and solar luminosity. It is associated with joy, sunshine, and the tropics. Orange represents enthusiasm, fascination, happiness, creativity, determination, attraction, success, encouragement, and stimulation. Orange is the color of fall and harvest. In heraldry, orange is symbolic of strength and endurance. Suggests a range from festive to when whitened, a loss of character. When diluted with black, declines into dull and withered brown. By lightening the brown, beige tones achieved suggesting warmth and quiet atmospheric quality. Violet combines the stability of blue and the energy of red and is associated with royalty. It symbolizes power, nobility, luxury, and ambition. It conveys wealth and extravagance. Violet is associated with wisdom, dignity, independence, creativity, mystery, and magic as well as chaos, death and exaltation. Solitude and dedication in blue-violet. Divine love and spirituality in red-violet. Light violet evokes romantic and nostalgic feelings. Dark violet evokes gloom and sad feelings. It can cause frustration. At least three (3) clearly differentiated hues are necessary. Strongest expressions of light and dark are the colors white and black. The effects of of black and white are in all respects opposite, with the realm of of grays and chromatic colors between them. Difference between level of brilliance and illumination. Obscured v. Revealed. Yellow and Violet have the strongest light – dark contrast. Contrast that is both physical and psychological. Red – orange represents is at the warmest range of colors, while blue – green is at the coolest. Cold – Warm properties can be described as: shadow / sun ; transparent / opaque ; sedative / stimulant ; airy / earthy ; far / near ; wet / dry. Two colors are called “complementary” when mixed together they produce a neutral gray. 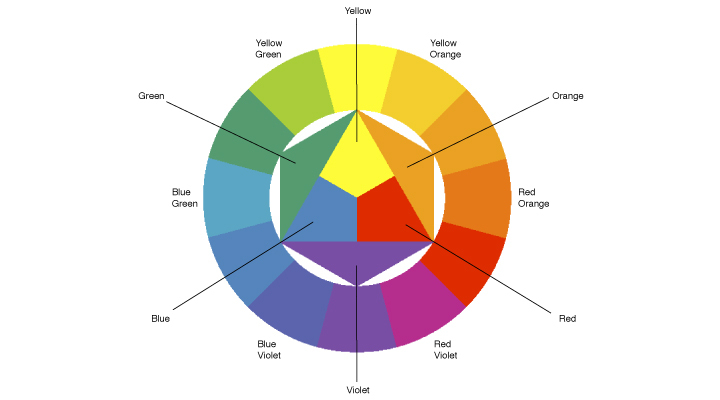 Analogous colors are any three colors which are side by side on a 12 Hue Color Wheel. 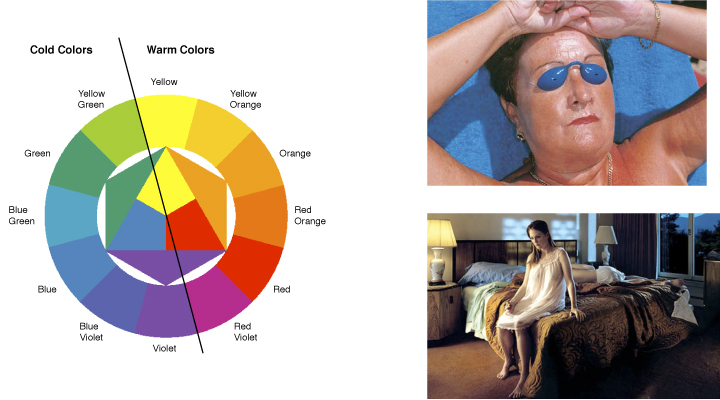 Results from the fact that for any given color, the eye simultaneously requires the complementary color, and generates it spontaneously if it is not already present. The simultaneously generated complementary color occurs as a sensation in the eye of the beholder, and is not objectively present. Relates to the degree of purity of a color. Contrast between pure, intense colors and dull, diluted colors. Involves the relative size of two or more areas of color. It is the contrast between large and small areas. Colors may be assembled in areas of any size, but the proportion between two or more colors may be said to be in balance or harmony so that no one of the colors is used more prominently than the other. Click on the following link, Adobe Kuler, to activate a web-based application for viewing color relationships and color contrasts. Click on Create to view color wheel.